*This topic explains how the invoice journals or open vendor invoices are reconciled with the timsheets. After the contract employees have entered their time, it will be available for reconciliation on the invoice journal or open vendor invoice from the vendor associated to the contractor. The SubContractor Reconciliation form is available in the below location. Go to Accounts payable >Invoices > Invoice journals > Lines. The reconciliation checkbox will be available only when the vendor belongs to the vendor group where the sub-contractor reconciliation checkbox is marked. Mark the checkbox for the Subcontractor reconciliation button to be enabled under the Functions button. Below are the fields available at the header section of the form. All of these fields serve as filters to fetch the right data for reconciliation of the invoice with the hour/expense transactions entered by the sub-contractor. From date Select the date, to view all transactions from this date is displayed in the Overview pane. 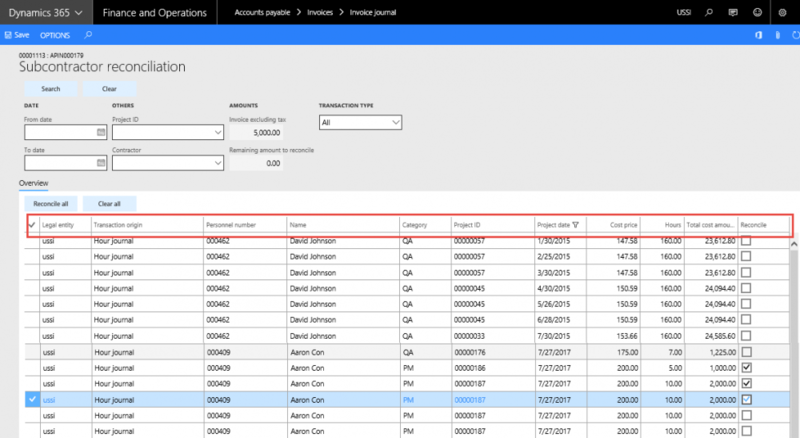 If left blank, all transactions related to vendor subcontractors is available on Overview pane. To date Select the date to view all transactions till this date displayed in Overview pane. If left blank, all transactions related to vendor subcontractors is available in the Overview pane. Contractor Select the identification of the contractor. View the list of all contractors attached to the vendor who is selected on the journal line. Project ID Select the identification of the project. View the list of all projects available on projects form. Projects are available from all the legal entity. Remaining amount to reconcile Updates with amount set on journal line. This amount is positive when entered credit amount for journal and negative when entered debit amount for journal. This amount decreases to extent of timesheet records marked for reconcile. Search button Click this button to search criteria given on above columns gives results on Overview pane. Reconcile all Click to select all records and reconcile all of them. Clear all Click on this button will clear all the records which is selected for reconcile. Transaction type Selection of transaction type will display view list of all projects transaction based on selection transaction type. All selection display all the hour as well as expense transactions. Legal entity Legal entity of the origin transaction will display on this field. Transaction origin View the transactions that generated the voucher. Personnel number Number of the contract worker, based on the filter entered in the search section. Name Name of the contractor worker. Category Category with which the timesheet has been booked is displayed here. Project Provide entries for project selected on criteria. If no project selected on criteria, all projects will be listed. Hours Lists the hours booked by contractor. Cost price Lists the cost rate of hours booked by contractor. Total cost amount Cost price multiplied by hours. Reconcile Select this checkbox makes timesheet entry available for reconcile. Once this checkbox is selected for a record, the related amount gets deducted from total amount remaining for reconcile. The Amount remaining to reconcile field has 5000 amount. All timesheet entries are available in the Overview pane and only marked lines are available for reconcile. The Hours records entered for the contractor will be shown only if the Activate subcontractor timesheet reconciliation checkbox is selected, and for the expenses, select the Activate subcontractor expenses reconciliation checkbox. Unless amount remaining is zero, the system will not allow posting the journal. Thus, only once an invoice is fully reconciled can it be posted. Also when any line is selected for reconciliation, it will not be available for selection in the next vendor invoice or invoice journal. Subcontractor reconciliation functionality has been extended to Open vendor invoices. The functionality is similar to what is available in the Invoice journal form. 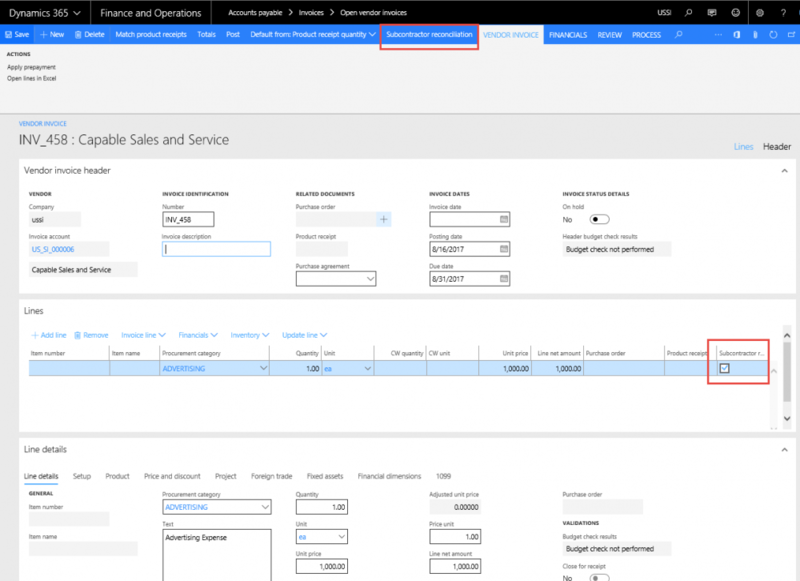 The subcontractor reconciliation button is enabled on the action pane when the vendor selected in the invoice belongs to the Vendor group that is selected as sub-contractor. When the subcontractor checkbox is selected on the line, it will be available for reconciliation in the Subcontractor reconciliation form, which will open if you click the subcontractor reconciliation button on the Action Pane. However, the Subcontractor reconciliation button will be disabled if there is a project attached to the line. The reconciliation available in this form is per line. Unless the amount to reconcile is zero, the user will not be able to post the transaction. VAT that is included on the invoice that is being used for Subcontractor reconciliation transaction, will consider only the amount excluding taxes for reconciliation. For example, if the invoice total amount is $150 and VAT is $30, the reconciliation process will take $120 into account for reconciliation. SubContractor Reconciliation will support multi-currency scenario for Account payable invoices when transaction currency is different from the accounting currency. SubContract Reconciliation form will support inter-company transactions posted against contractor. The following logic applies while selected intercompany transactions to reconcile in AP vendor invoice. For intercompany: Pick the cost price/cost amount from the Timesheets. For non-intercompany: Pick the cost price/cost amount from the hour transactions table. For Intercompany: Pick the cost price/amount from Expense report (Amount in MST). For Non-intercompany: Pick the cost price/amount from Expense transactions table.